The world’s largest bicycle manufacturer is evaluating a “lucrative” offer received from the Himachal Pradesh (HP) government to relocate its ‘Cycle Valley’ to the state on better financial terms and upfront provision of 100 acres of land. Under the ‘Cycle Valley project, for which the Punjab government has proposed Ludhiana, Hero Cycles was planning to set up a mammoth bicycle production facility with annual capacity of 8 million units scalable to 12 million units, or 10 per cent of bicycles sold worldwide. However, with over three years of delay in the cluster development project by the two successive governments in Punjab, the bicycle manufacturer seems to have lost its patience and has started scouting for alternate sites outside the state. “A senior delegation from the Hero Cycles group had an exclusive meeting with the Himachal Pradesh chief minister Jai Ram Thakur and other key officials from the state government recently. During the meeting, the CM is believed to have offered a fairly large land bank (over 100 acres) along with incentives which include tax benefits and other large scale benefits. The company is evaluating the offer and would decide on its investment soon,” said an industry source privy to the development. A Hero Cycles spokesperson declined to comment on the issue, while officials in Punjab government refused to go on record on the development. 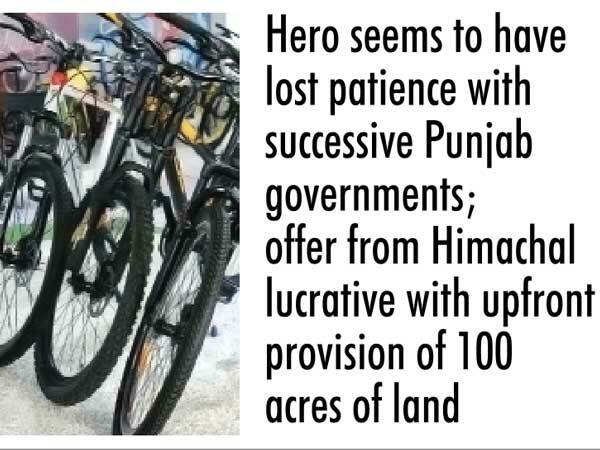 A Himachal government official confirmed the meeting and said that the state government’s offer to Hero Cycles is extremely lucrative and hard to ignore. “The location strategy will be primarily driven by the needs of customer and stakeholders. Himachal Pradesh’s proximity to Delhi seems to be a conducive and productive destination for Hero Cycles’ plans,” said the source quoted above. If Hero Cycles decides to move out the ‘Cycle Valley’ project, it would be a big setback for the Punjab on its way to further strengthen its position as the bicycle manufacturing hub of the country. Hero Cycles proposed to make initial investment of Rs 250 crore in the Cycle Valley project with plans to further scale up operations and investments in future. Hero Cycles chairman Pankaj M Munjal is upbeat about the Indian government’s ‘Make-in-India’ initiative that aims to give a boost to domestic manufacturing and make India the next major manufacturing hub. He is thus looking at creating an entire eco system for bicycle manufacturing in a specialised park that would also bring in company’s prime vendors from abroad. In fact, the cycle manufacturer planned to have around 10 joint ventures from Japan, Germany, Taiwan and China in the cycle valley. The company was also ready for ground-breaking ceremony of the valley project on August 15 and wanted to complete it in about a year to year-and-a-half time. But the project seems to have got struck again. Hero Cycles is a unit of Rs 2,600 crore Hero Motors Company (HMC). The HMC Group with a $ 1.2 billion asset base and over 10,000 people across the globe comprises of the bicycle giant Hero Cycles, Auto parts manufacturing companies-Hero Motors Ltd, ZF Hero Chassis Systems, and Munjal Kiriu Industries, hospitality arm Munjal Hospitality and luxury home décor products company Oma Living. The group has been clocking a healthy 25-30 per cent growth in hi-end bicycle market while a relatively lower around 8 per cent in another segment. It has about 40 per cent share of the domestic market.